Sailing around Marina Bay and up the Singapore River was one of the many highlights on this amazing trip. The boat ride takes you all around the financial district of Singapore, so in addition to all the colourful restaurants, bars, and nightclubs, you're also surrounded by towering skyscrapers, large museums, the famous Merlion statue, and even the parliament building. It was on the river cruise that I really had to pinch myself about where I actually was. 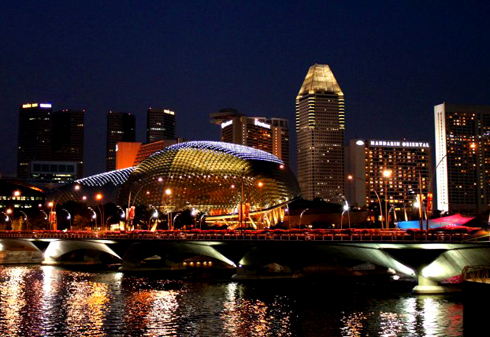 The red lanterns, Asian signs, and impressive structures all emphasized the vibrant and modern culture of Singapore. The small country proved to be a mash-up of numerous Asian and western influences, and the wealth of the country was unmistakable in all the scenes we were witness to. While there was a lot to love Singapore for, it was cruising down the river that actually gave us a moment to let it all sink in. Time slowed down just for a moment. The cityscape and just the feeling of being there amongst something so mesmerizingly beautiful was surreal. I will remember this dream, this mix of lights, colour, reflection, and motion. I could feel the breeze. It was real. Very poetic Stephanie, it really was incredible. Now that I'm back home it feels just as strange to think where we actually were.